Some of you will know after reading this post back in September, I recently decided to put together a new system build to replace my then aging X58 rig. Sadly due to other commitments I didn’t get a chance to create a build log of progress on the system but I can say that it’s now fully built and running great! The build didn’t go completely smoothly however, and there was a few issues I ran into, from a buggy UEFI BIOS to a CPU watercooling loop that refused to bleed properly. When I first got the system running at a basic level to ensure all components were operational I found a number of issues with the early revisions of the UEFI BIOS for the Asus Rampage V Extreme Motherboard. One issue I ran into was when saving my changed settings back, this appeared to work until the system power cycled only to find the BIOS had reverted the settings that I had just changed. Another issue that seemed to crop up was during the Windows boot process. After the UEFI splash screen the system boot from the RAID0 SSD array then simply just hang at the Windows splash screen, resulting in me having to power cycle the system from the reset switch several times until it would eventually boot into the OS normally. Thankfully both of these issues have now been fixed with subsequent BIOS updates. 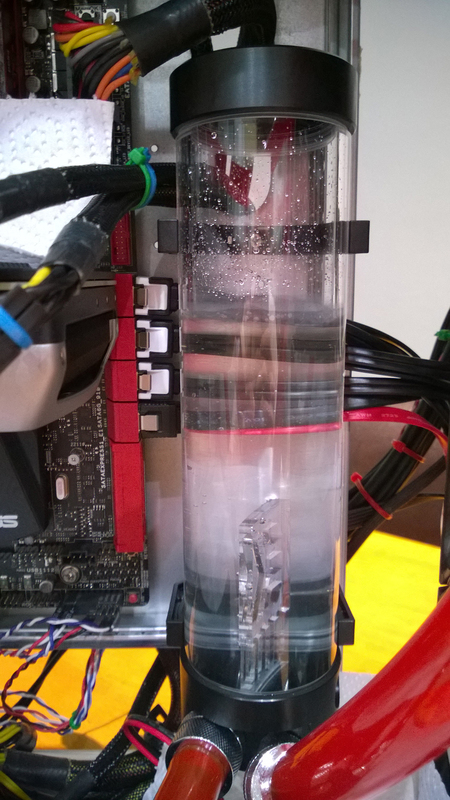 Shortly after I assembled the CPU watercooling loop and leak tested, I began to notice an issue were there was still large amounts of air still trapped in the loop that would refuse to make its way out no matter what I did, accompanied by a rather annoying “swooshing” sound as the bubbles continued to pass through. Tipping the case from side to side, upside down, turning up the speed of the pump and shaking the tubing literally done nothing to stop this, and even after a few weeks it hadn’t settled any. 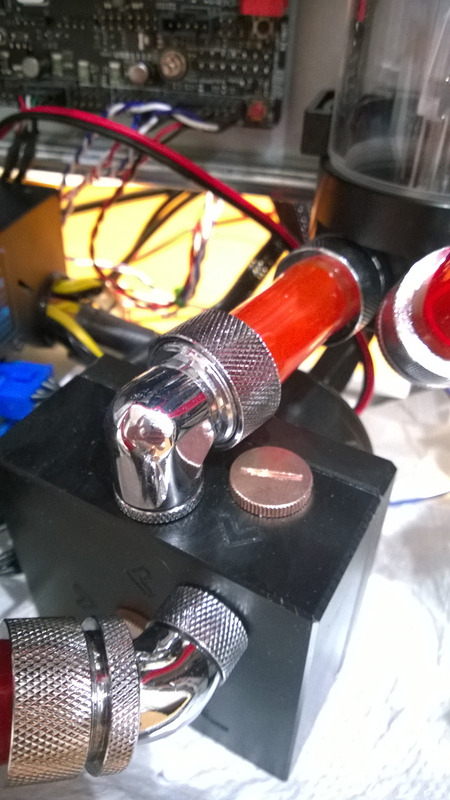 I have built many other custom watercooling systems for various people and while some can be harder to bleed than others I haven’t come across a situation where air couldn’t make its way out of a loop. Turning my attention to the EK CSQ Single Bay reservoir I could see that it was allowing bubbles to make their way back into the pump, and due to the high flow rate of the V655 pump it was almost creating a vortex effect inside the reservoir which explained the “swooshing” sound I was hearing. In order to fix this I decided to replace the single bay reservoir with a cylinder type, and opted for the EK 250 Res X3 which just so happens to have an anti-vortex design. 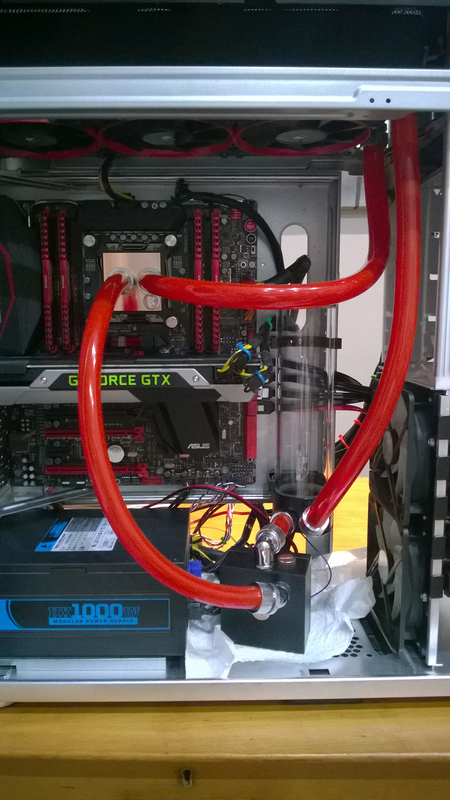 Unfortunately this meant draining and disassembling the current loop. To add to the now piling list issues, the supplied support brackets for the new EK reservoir didn’t line up with the pre-drilled holes on the motherboard tray of my ATCS 840 chassis, nor were the screws the right size. I had to drill out two additional holes to then fit the supplied screws and nuts to the brackets. However, once the res was in place and the loop filled it bled in seconds and was also practically silent, to the point where I can now only just about hear the pump! As I mentioned at the start of this post, I didn’t get the time to put a build log together for those who were interested, but I do have various pictures of the finished system which are posted below. I will try to get more soon as well.